Need an antidote to the saccharin-fest of Valentine’s? Then come on down to Hand of Doom’s twisted tales of love and lust on Friday, February 15 from 8pm at Juncion 13, 1B Town Walk, Folkestone, CT20 2AD. Fabulous poundshop prizes are also up for grabs in our usual competition. Tickets cost £5 and are available from the venue or from https://bit.ly/2SahbTt. Come early to get a good seat. Prepare to be scared this Halloween in the ghostly town of Folkestone! Hand of Doom Productions once again invites you to gather round and hear some terrifying tales, monstrous monologues and scary sketches by Anthony White, Ribs Norman, Neil Dillon, Michele Sheldon, Adam Skipper, Louise Burgess and Charles Bain Smith. It takes place on Saturday, October 27 at the Eleto Chocolate Cafe, Rendevous Street, Folkestone, from 8.30pm to 10.30pm. Doors open at 8pm. Drinks are available from the bar (cash, no cards). Competition during the interval to win some ghoulishly cheap treats. Tickets cost £6 and are available on the door or from Ticket Source. Come and listen to some tales of May madness, Mayans and a certain hairy rock star at Hand of Doom’s May-themed story nights in Kent. They take place in Folkestone on Friday, May 19 at the Grand Hotel, The Leas, and the following evening, Saturday, May 20, in Faversham at The Guidhall, both from 7.45pm for an 8pm start. 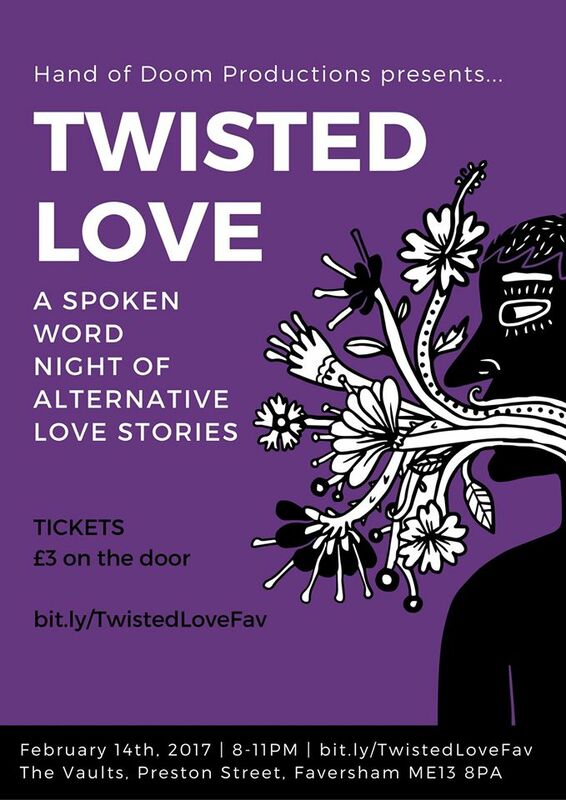 Hand of Doom presents not one but two nights of alternative love stories. The first takes place on Valentine’s Day, Tuesday, February 14 at the Old Wine Vaults, Faversham, from 8pm to 11pm followed by another on Friday, February 17 from 8pm to 11pm at Folkestone’s historic hotel The Grand. Gather round to hear a host of twisted tales of the heart brought to life by actors and writers. Come alone, or with your partner but don’t expect romance. Writers include Charlotte Forfieh, Kate van der Borgh, Mike Blakemore, Truda Thurai, Ribs Norman and Michele Sheldon. Faversham £3 on the door. Folkestone £6 from Ticket Source or £7 on the door. For more details go to Twisted Love.